The Malaysian government uses the Sedition Act to silence its critics. You know that, and they know that. When charged, you have to go to court, the money, the time, the worry factor are all meant to psychologically work, on you and the rest of the rakyat. On 12 February, 2016, The Attorney General, Apandi Ali withdrew the Sedition charged against law lecturer, Dr. Azmi Sharom. That charge was a waste of time and resources. Public money was unnecessarily spent and Azmi need not have gone through the trauma and expense. Adam Adli, Zunar and Hishammuddin Rais, have also been charged with Sedition. Zunar holds a record nine charges. The government knows that these people can influence more people, through their dynamism, and creativity, than a life-time’s worth of Umno-Baru government propaganda. Adam’s exuberance appeals to the young whilst the intellect and wit of both Zunar and Hishamuddin, captivate the rakyat. These men should be freed. Not fined. Not jailed. Why is Hishamuddin Rais a thorn in the government’s side? Have you met Hishamuddin Rais? Or read his books, his writings, his poems, watched him as a stand-up and sampled his cooking? His fish-head curry is one of the best.Â His jokes are in good taste, and it is impossible to persuade him to visit a museum. When he gets excited, his glasses steam-up and if he were to talk rapidly, even his teeth assume a life of their own. The playwright, philosopher, jail-critique, cook, adventurer, story-teller, government mocker, social activist, dog-lover, romantic, and stand-up comic is to be jailed, for nine months, for urging the public to topple the government. He will appeal. The judges know that Hishamuddin is dangerous. The playwright influences minds. He makes people think, and uses actors to convey the message to the rakyat. Former PM Dr Mahathir Mohamad knew how dangerous playwrights could be, and arrested them in Operation Lalang, for one reason alone. Thought. 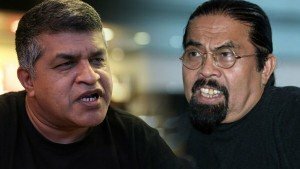 On 15 January 2016, the High Court Judicial Commissioner, Nordin Hassan, said that it was a “very serious” crime, when Hishamuddin had urged the rakyat to take to the streets and reject the results of the GE-13. Hishamuddin’s writing, his poems and plays, provoke the audience to strike a spark of social change, change their outlook and their lives.Hishamuddin is a widely travelled man, prosecuted for his forthright views on a wide range of subjects, who has a knack for drawing on his life’s experiences to relate to the rakyat. He is able to raise our awareness of various issues, shock us with his plays and his writing, and shame us into speaking-out, instead of choosing the easier option of keeping silent. Having experienced life abroad, he can draw on various cultures, his love of food and observations of people, to make us think. He urges us to drop our sheep-like mentality, inspires us to do what Malaysians, especially Malays may think is outrageous, like learning about other cultures, and having girlfriends or boyfriends, from other races. So, is Hishamuddin dangerous? For the people in power, who bully the rakyat and abuse the law, to imprison those who seek a better Malaysia, yes, Hishamuddin is very dangerous. Hishamuddin, the playwright, plays with words, uses imagery and drama to make us think. He wants us to expand our horizons. He is a one-man mean machine. If he were not a threat, he would not be given a hefty jail term, especially after the authorities have said they would reform. This is a government in retreat, and Hishamuddin is right.